At Life Church we believe prayer is not an option; it’s a lifeline. Prayer is a spiritual connection with God and is necessary for anyone desiring to truly know Him. Prayer is also the fuel we need in order to fulfill our calling. We want you to know that Life Church is a church that prays. If you have need of special prayer we are available during or after each service to pray with you. 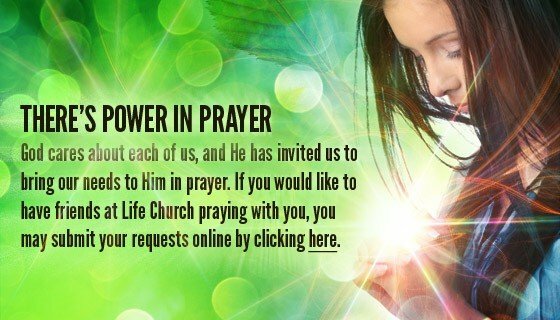 Or, if you prefer, email your prayer requests to info@lifechurchcalvert.com. You can expect Life Church to model a great reliance on prayer and emphasize its importance within the life of every believer.